Lehlohonolo Phakedi from Botshabelo Township outside Bloemfontein, had to learn sign language from a young age becuase he was born deaf. Sabata, who is not deaf, learned sign language from deaf people and became so skilled that he ended up being a sign-language interpreter. Phakedi and Sabata both believe that people should volunteer for the right reasons. Phakedi decided to volunteer for the World Cup to create awareness about deafness and to show visitors that South Africans care. "I want people to understand that deaf people are just like everybody else. They are capable of doing anything," he said. Sabata, who supports Phakedi's views, said he volunteered to be a sign-language interpreter to raise awareness about communication between deaf people and those who can hear. "Together, we want to show the rest of the world that South Africans care for all their visitors. We also want to show the world our country's ability to involve different people, including those with disabilities, in major projects such as the FIFA World Cup," Sabata said. "Volunteers must be committed and have passion for what they do. Money should not be the only motivating factor when you offer your services." Apart from the World Cup, the two Bloemfontein-based sign-language interpreters both worked as volunteers during the Confederations Cup in June last year. Phakedi did administrative work, while Sabata worked as a sign-language interpreter. 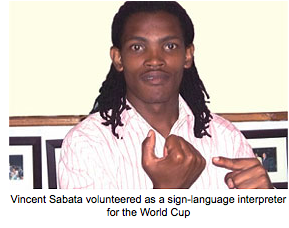 Sabata has attended several training courses in sign-language interpreting. These have been offered by the National Deaf Service Institute of South Africa and the Deaf Federation of South Africa, where Sabata works as a volunteer. In his free time, Sabata also works as a volunteer for the Free State Department of Sports, Arts and Culture helping deaf people who work there. The Pan South African Language Board (PANSALB) has offered Sabata a bursary to study for a sign-language qualification at the University of the Free State. 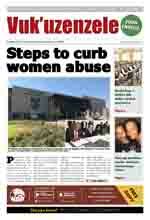 Phakedi does volunteer work as a receptionist and administrator at the offices of the Free State Deaf Association. He is also chairperson of the Botshabelo branch of the Free State Deaf Association. Two young Free State men want to show the world that South Africans care equally for all their visitors. They also want to raise awareness about communication between deaf people and those who can hear. Lehlohonolo Phakedi and Vincent Sabata will be sign-language interpreters for people with hearing disabilities during the FIFA World Cup. They have been selected from thousands of applicants who volunteered their rare skills for the tournament.